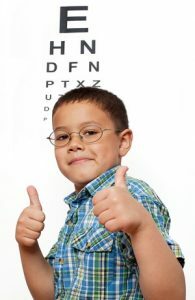 Sacramento Optometric Group, our optometrists will evaluate your child’s eye health and visual system, to make sure that a problem with eyesight doesn’t interfere with his/her ability to rise to the top of the class! Our team of professional optometrists are all highly skilled and experienced in examining and treating kids. We will greet your child warmly, with a gentle and friendly manner. We understand that proper pediatric eye care depends upon a positive relationship between the child and eye doctor, and we are devoted to creating a pleasant experience for kids in our Sacramento office. What do we check in a pediatric eye exam at Sacramento Optometric Group? When we first meet you and your child, we will ask you a series of questions about your family eye history, child’s medical case history, medications, allergies and any concerns you may have about your kid’s vision. Please come prepared with questions, and we’ll do our best to answer them comprehensively! In sum, we’ll assess the total range of your child’s visual system and skills, including eye teaming, eye mobility, eye-hand coordination, peripheral awareness, color vision, near and far visual acuity. The particular procedures and testing methods that we use are highly dependent upon the age of your child, as well as the developmental stage. Many parents worry that we won’t be able to check pediatric vision accurately because their child hasn’t learned the alphabet well, or is too shy to answer our eye doctor’s questions. Fortunately, we have many varied and detailed ways to assess vision – even for kids who can’t read or won’t read aloud. One method is retinoscopy, in which we shine a light into your child’s eyes and observe how the retina reflects it. Another effective technique involves using LEA symbols, which are specialized pictures (such as a house, circle or apple) that are used in place of basic letter and number charts. Random dot stereopsis is also beneficial as a way to evaluate eye teaming by displaying dot patterns to kids. We’ll examine your kid’s visual acuity carefully during these ages, as problems such as nearsightedness, farsightedness and Astigmatism are common. If we diagnose a need for vision correction, we’ll prescribe eyeglasses or contact lenses. Additionally, we’ll check eye health and eye alignment to inspect for any other abnormalities. Our professional Sacramento optometrists will use a high-powered lens to look at inner eye and retinal tissues for any problematic signs. What eye problems are often diagnosed in kids? Hands-down, refractive errors, such as astigmatism, nearsightedness and farsightedness, are the most common eye conditions in children. Other relatively common diagnoses are convergence insufficiency, trouble with accommodation/focusing and difficulty with binocularity or eye teaming. If left untreated, all of these conditions have the potential to interfere with reading, writing and information processing. “Lazy eye” (amblyopia), is another usual eye condition that is generally treated by patching the stronger eye in order to help strengthen the weaker eye. When we detect strabismus, which refers to an incorrect positioning of eye muscles, eye exercises or surgery may be recommended – depending upon the severity of your child’s specific case. After our professional, qualified optometrists perform your kid’s comprehensive eye examination in our Sacramento office, we will sit down with you to discuss all of our findings. Working together with you and your child, we will determine the most suitable and helpful course of treatment. When should you book a complete eye exam for your child? If your kid doesn’t need vision correction, follow-up exams should be done every 2 years throughout school. If any vision correction is needed, then annual exams are advised.